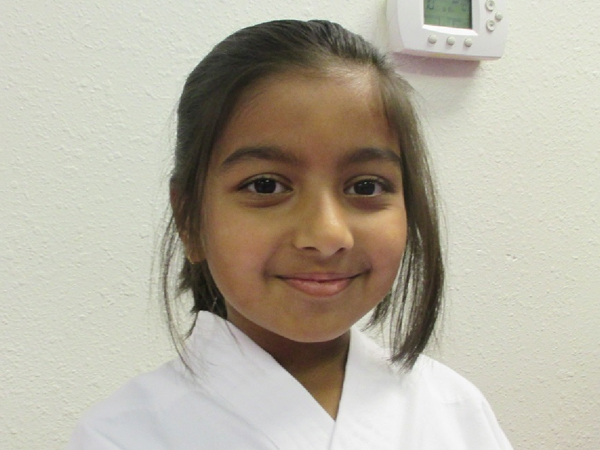 Ojas started with AASD in November of 2015. As a current white belt getting ready for yellow belt test soon, Ojas shows respect and dedication that sets an example for others to emulate. Always giving 100% and then some, not only does Ojas set the example of never give up, but without being asked she is eager to help other students who may be struggling in any area. Ojas posseses traits of leadership not normally shown in people her age, which means she shows great humility and unselfishness in class. This is not only what Sifu Rick and staff strive for from students, but must have been taught at home as well. Sifu Rick and staff wish to congratulate Ojas’s parents, Parag & Shikha, for all their support of Ojas and our Black Belt school. Lose the extra pounds — There is a direct correlation to extra pounds and high blood pressure. In fact, much of the advice or suggested lifestyle changes given to those with hypertension can naturally result in weight loss. Exercise regularly — Exercising for 30 minutes a day, four or more times a week, can significantly impact your blood pressure. The best types of activities for lowering blood pressure include walking, jogging, cycling and most aerobic exercises. Reduce sodium — Even a small reduction in sodium intake will produce positive results. Eat fewer processed foods, don’t add salt, and check the sodium content on your food labels. Gradually cutting back on your sodium intake, instead of making radical changes to your diet, will help ensure you stick to it. Quit smoking — Every cigarette you smoke increases your blood pressure for minutes after you finish lighting up. Cut back on the caffeine — Caffeine can raise blood pressure by as much as 10 Hg in people who don’t consume it regularly. Reduce stress — Chronic stress is a big contributor to high blood pressure as well as many other illnesses. Reducing stress is key to reducing blood pressure. Keep in mind reducing blood pressure often requires a lifestyle change. This takes time and effort, but it is critical to a happy and healthy life. Spring showers bring May flowers — and wet driving conditions: Slow down on slick roads and increase your following distance even when mist begins to fall. Just a small amount of water can mix with oil and grease on the road to create slippery conditions. Hail season: Beware of hailstorms, particularly if you live in a hail-belt state (Wyoming, Colorado, Kansas, and Missouri). Even small hailstones can shatter windshields, and raining balls of ice are never good for the roads. Animal activity: Animals are incredibly active during the spring. Some are emerging from hibernation, and others are entering mating season. This could mean that more animals are crossing streets and roaming around. Many animals, especially deer, are most active at dawn or dusk. Winter road wear and tear: In many states, winter wreaks havoc on the roads. Snow plows, salt, sand, and the aftermath of ice can all leave roads a bit battered. Once snow melts away, expect to drive over new potholes. Share the road: Warm weather brings out motorcyclists, bicyclists and pedestrians. Replace your wiper blades: Worn-out wiper blades may not be up to the task of clearing water away from your windshield. Check your wiper blades and replace them if necessary. Understand the impact of medications on driving: For many people, spring means seasonal allergies. Over-the-counter allergy drugs can have side effects or interact with other medications to diminish your driving ability. If possible, go around potholes: Deep potholes can throw your car out of alignment or worse, forcing you to buy a new wheel and a new tire. You may be able to file a claim (laws differ from city to city and state to state), but you you’ll likely have to prove negligence on the part of the city. Avoid driving through large puddles: Driving through water can impair your brakes, cloud your vision, or cause you to hydroplane.